These peanut butter homemade protein bars literally only take 10 minutes to make from start to finish. All you do is mix 5 ingredients together, press them into a pan, cut them and enjoy. Perfect for a last-minute snack, especially for right after a workout. Every once in a while, I get the question, “do you eat a post-workout snack?” The answer is YES, I always eat something after I workout, usually because I am starving, but also because I want to refuel my body after putting it through a rigorous workout. I like to get in a good serving of protein and carbs for my post-workout snack. I like carbs after I workout because they help replenish my depleted glycogen stores, and I like protein to help rebuild muscle tissue and aid in recovery. If I have had an especially long and sweaty workout, I like to replenish my electrolytes as well (usually with a green juice). Protein smoothies are great, but they aren’t the most convenient snack. You need access to a blender…so if I know I won’t be able to go straight home after my workout, then I like to pack a couple of these peanut butter homemade protein bars. They are super easy to make, include protein, carbs, and healthy fats and are delicious. Perfect for a busy day on the go, or after a good workout. I usually eat two of them at a time, but once again, I am really hungry after I workout :). I caught myself more than a few times looking aimlessly in the fridge and pantry for something to munch on, and a couple of times I found myself mindlessly taking bites of my kids’ snacks. I am a big fan of snacking, and usually, have 2-3 snacks each day, but I am not fond of mindlessly snacking when I am not actually hungry. Typically, when I get I get like this, I grab fresh fruit or veggies to snack on, but I desperately need to go to the grocery store, so my fresh produce was very limited, and I am sure I could come up with a ton of other excuses :). So that’s when I usually make these bars. I pretty much always have these ingredients on hand and I bet most of you do too. 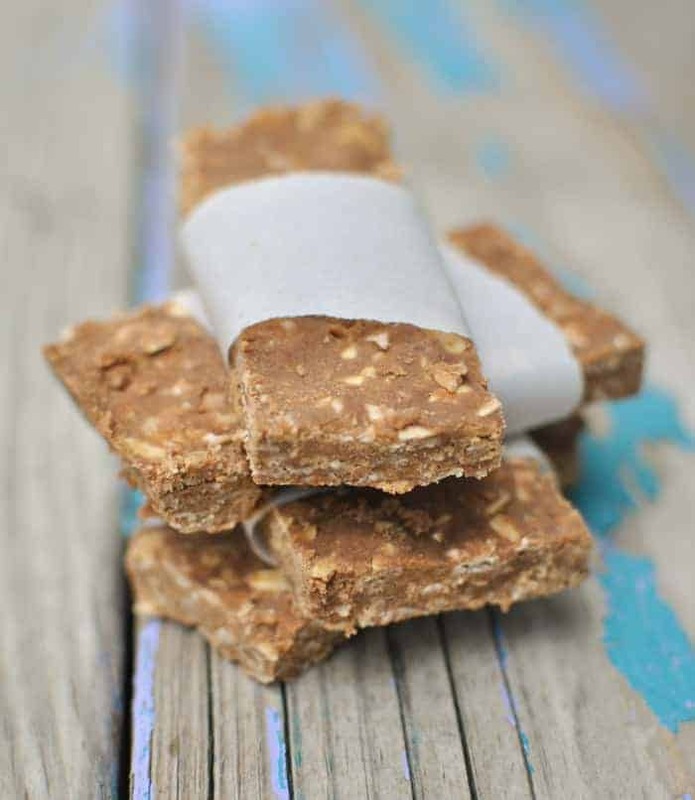 I would love to know if you try these homemade protein bars and what you think of them. Please comment below and let me know what you think! These peanut butter homemade protein bars only have 5 ingredients and only take a few minutes to throw the ingredients together. That’s all you do is mix, press in a pan and you can eat them right away! Looks pretty easy to make and a whole lot less expensive than store bought protein bars.